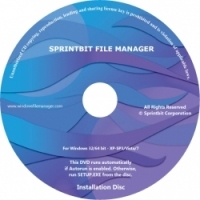 Sprintbit File Manager for Windows XP/Vista/7 (all systems 32-64 bit) is a fully featured application for viewing and managing files on your or network computer. You can perform all standard file operations like copying, moving, renaming, deleting, creating folders, shortcuts etc. You can process multiple files to a several folders at once by use macro commands or Multi File Manager. You can open unlimited number of File Managers, File Browser and Explorers windows. You can view selected files contents or get detailed information about any file using Files Viewer. Files Viewer recognizes a lot of file types, and it will show you the contents of any text file type, play audio or video, view playlist, show pictures, browse web pages, view or play encrypted files etc. You can also edit and print documents using professional text editor built-in. Files Manager includes following tools; ZIP Archiver for creating, browsing and extracting ZIP, TAR GZIP and BZIP archives. Picture Viewer with editor and Images Converter. Mass File Renamer with a lot of options for making all the file names with the identical format using predefined presets. Folder Synchronizer with scheduler and favorite folders database, Link Validator & Editor for validating links. Using cryptography feature you can encrypt & decrypt files with the most known encryption algorithms. Then you can view or play encrypted files in-the-fly, and our other media programs are compatible with it. Other features; Folders & Drives Information, Startup Manager, Macros Editor, Cookies Manager, Files Searcher, Split - Merge, Join Files, File Attributes, Wildcard tools and more.